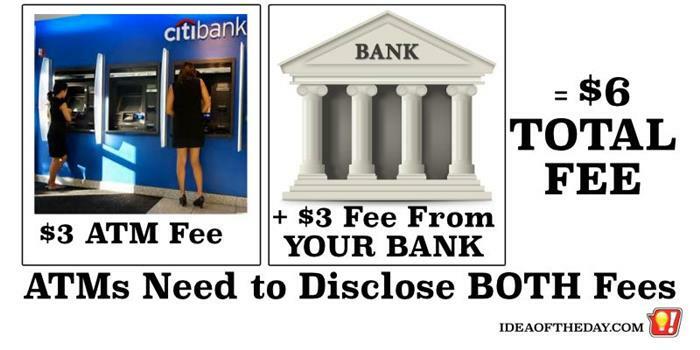 ATMs Need to Disclose ALL Fees. Let's put a stop to $6+ ATM Fees. Not long ago, people complained when ATMs started charging 50 cents to withdraw funds. Now that ATMs cost as much as $6 or more, why aren't people complaining? Perhaps they don't know the whole story. I would often use a Citibank ATM instead of my own bank, because it was 2 minutes closer to me and it had better parking. Every time I used that ATM, it warned me that they charge $3 to use their ATM. That's only half true. Each ATM withdrawal was actually costing $6, because my own bank charges a $3 fee too, but the ATM doesn't tell you that. You only find out if you look at your bank statement.